W.R. Rodriguez grew up in the South Bronx. A graduate of DeWitt Clinton H.S. and Fordham University, he moved to Wisconsin, earned an M.A. in English, and began writing poetry about his experience as a bootblack in the family shoe shine parlor. After the 1984 publication by Ghost Pony Press of the shoe shine parlor poems et al, he continued to explore his memories of The Bronx. His second book, concrete pastures of the beautiful bronx, had a couple of near misses with literary presses. In 2008 he revised the manuscript, did his own layout and design, and published it under the Zeugpress imprint. He planned to follow up with another book to complete what he calls The Bronx Trilogy. Upon his retirement from a thirty-three year career as a high school teacher, he completed from the banks of brook avenue. The electronic version was released in the fall of 2015. After months of revision, the print edition and the updated e-book were released in early 2016. This was followed by the e-publication of The Bronx: Three Memoirs, a compilation of three articles written for The Bronx County Historical Society Journal. Abraxas, Bellingham Review, Croton Review, Dusty Dog, Epoch, Negative Capability, North Coast Review, The Critic, The Spirit That Moves Us, Turnstile, Wormwood Review, Z Miscellaneous. See Bibliography for a more complete list. 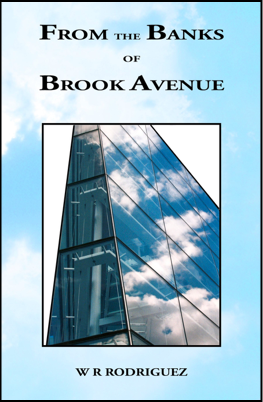 From the Banks of Brook Avenue offers a humorous, ironic, passionate, and vivid exploration of the cityscape. Subways, bridges, streets, public schools, parking meters, sewers, buses, baseball: these are some of the subjects explored by W. R. Rodriguez who has both a sense of history and a keen perception of the ordinary. A large threatening man tapping knees on the IRT, a bus running over a pigeon, a dog chasing a broken car which is being pushed by a man, a woman dropping a flower pot on a mugger’s head, and other strange but true events combine with tributes to the Triborough Bridge, the Third Avenue El, and George Washington. Concrete Pastures of the Beautiful Bronx explores the beauty, wonder, and harsh reality of the urban environment. W. R. Rodriguez has a strong poetic voice that uses irony and humor. He treats his subjects in a variety of styles: narratives, lyrics, long poems, and prose poems. Vivid and abundant imagery abound; the reader will get a sense of being there. In “my little red fire engine” he combines the memory of childhood play with the observation of a tenement fire. The prose poem “democracy” tells the story of an ethnic fire cracker war on the Fourth of July. The long poem “roosevelt’s bust” gives a synopsis of Bronx history over four decades, from the Depression to the Kennedy assassination. The “saint mary’s park” sequence begins with his playing in the park and ends with a nostalgic look at his mother in her youth. His vision is unique; it transcends the stereotype many have about those who write about the inner city. 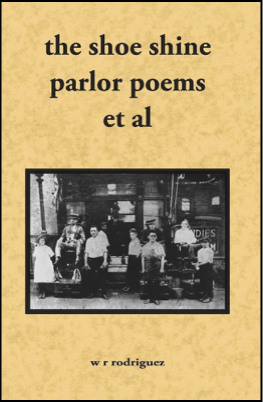 The Shoe Shine Parlor Poems Et Al: Second Edition has the same poems as the first edition, but it includes a preface written by the author and a bibliography. A limited number of print copies were released to complement the completion of The Bronx Trilogy: three books of poetry about The Bronx and its environs. It is also available as an e-publication. The Shoe Shine Parlor Poems Et Al: A Teacher’s Guide is designed to help teachers use The Shoe Shine Parlor Poems Et Al as a classroom text. W. R. Rodriguez, who is a poet and teacher, offers an author’s introduction, a vocabulary list, and several pre-reading and post-reading questions and activities for each poem. It is only available as an e-publication. 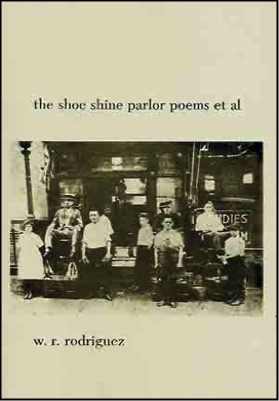 The Shoe Shine Parlor Poems Et Al is the W. R. Rodriguez’s first book; this is the original Ghost Pony Edition. These narrative and lyric poems derive from the author’s youth in the South Bronx and his work as a bootblack in the family shoe shine parlor during the 1960s. The first section, “the shoe shine parlor poems,” contains narratives and character sketches of neighborhood personalities: the man who pretended to be a policeman, the golden glove boxer beaten senseless by the police in a case of mistaken identity, the one-eyed heroin addict, the local bully receiving his ironic comeuppance, the seventh son whose luck ran out in the Vietnam War. The second section, “et al,” is a more lyrical view of the Bronx: a tribute to a goldfish imprisoned in the heel of a woman’s platform shoe, Thoreau thrown off a rooftop, a young girl killed while playing in the spray of a fire hydrant, the old accordion player’s swan song, a celebration of the weeds which even the Bronx cannot kill. 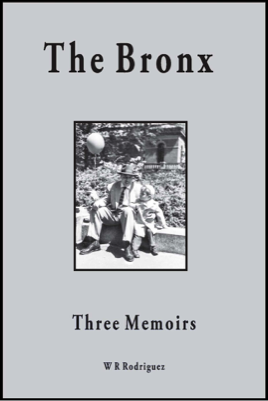 The Bronx: Three Memoirs is a compilation of articles written for The Bronx County Historical Society Journal. 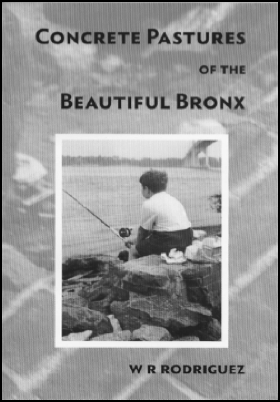 The memoirs cover a family’s life in The Bronx from 1922-2013. NYC photo courtesy of Everweb, which was used to create this site. Except for photographs and quoted materials, w. r. rodriguez reserves all rights to the contents of this site, both text and audio. Please do not copy or otherwise reproduce the materials without obtaining the appropriate permission. For details see: Copyright Information.